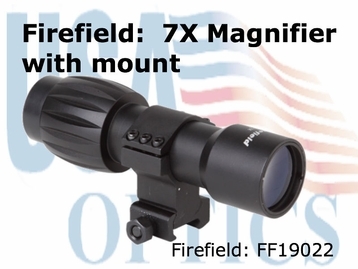 The FF19022 from Firefield - a 7x magnifier - will range and accuracy to any red dot or reflex sight when close-range battles spill into open ground. 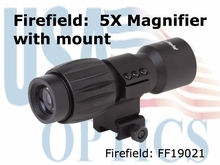 The Firefield series of Tactical Magnifiers are multifunctional weapons accessories designed for use in conjunction with holographic, collimated reflex, and other compatible weapons sights. 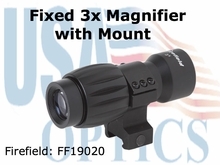 The 7x Tactical Magnifier increases the magnification considerably of the accompanying sight for greater sighting range and improves target recognition, especially at long-range distances. Featuring a wide field of view, the 7x Tactical Magnifier allows for superior target acquisition, and high quality multi-coated optics for precision accuracy and clarity. The unit's waterproof, fog proof and shockproof frame is exceptionally lightweight for maximum portability.